Im looking for an Xbox 360 :3, what's the cheapest price? Discussion in 'Miscellaneous' started by audifan, Dec 19, 2011.
lol, just go buy one for $200 you might be able to find one cheaper because of Christmas sales. You'll get lag based on internet connection and the number of people using your internet. My friend's Xbox lags an extreme amount, but he is in his basement with the connection on the main floor and always has 2-5 people using it at the same time. To play with friends you'll have to pay for Xbox Live, which costs like $10 a month or something. If you want the cheapest price, just wait for the Xbox 720 to come out, then the 360 will drop to dirt cheap. when do you think xbox 720 will come out? You'll want to be sure to get one with a hard drive and a wireless adapter (assuming you aren't going to hardwire connect it). Like others said, the lag will depend on your connection. If your internet is good the Xbox does what it's supposed to. would it help if my computer was off during gameplay? Well, what kind of internet do you have? like your Up and Down speed? I have Verison Fios, and only two computers in the house, always on. 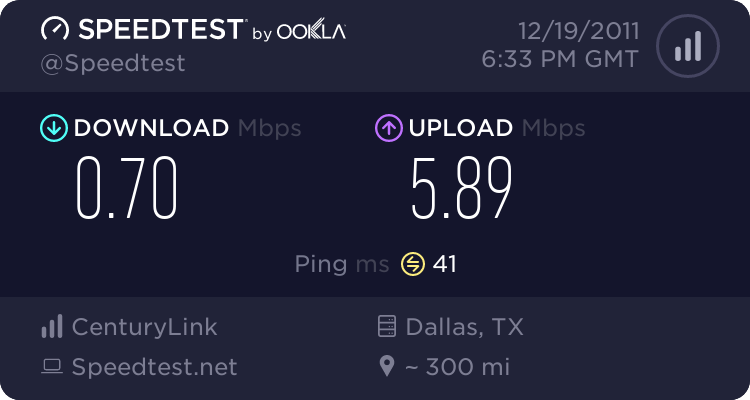 Go to speedtest.net and post what results you get. Normally the download is supposed to be higher than the upload. Your upload is very good though. Are you on the internet right now that you would use for your xbox? Oh lol, that makes somewhat more sense then, haha. Do that same test when you get home. I have no idea when the 720 will come out, but most likely sometime this coming year. I read it will comeout in like 2012 or 13? Because that's better than 720.